Well it’s hard to have a regular schedule since I am a Full time Firefighter/Paramedic as well. So we work 48 hours and then we are off for 96 hours. On my 4 days off I usually have at least two training sessions a day whether it is technique, boxing, muay thai, BJJ, wrestling or strength and conditioning. Then I work on meal prep and recovery. And of course a little down time with my husband, 3 fur babies, chickens and ducks. As I was getting into the fire service I heard about a local competition called Guns & Hoses where cops and firefighters boxed each other and all the proceeds went to an organization called Backstoppers, that supported the families of police and firefighters that have died in the line of duty. 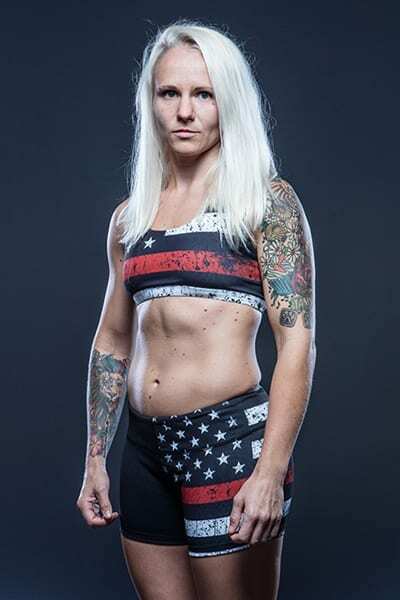 I began training and competed in several Backstoppers events and was even the first female MMA match ever at Guns & Hoses and I was HOOKED, and knew MMA would forever be a part of my life. I honestly feel lucky to be able to be a Firefighter/Paramedic and a Professional MMA fighter cause there is not anything in this world I would like to do more. I love both my professions. I think it’s a healthy balance, one day I’m helping someone through some of their worst moments or fighting a fire and the next I’m trying to make it someone’s worst day lol. Who says I don’t already? Ssssshhhhhhh. I’m pretty good with a bow and arrow.